Just finished this gem and loved it! I kept stealing away to silent places to read. I couldn't put it down, and I totally wanted to know what Perry had up his sleeve next. And boy, that is one big, curious sleeve! 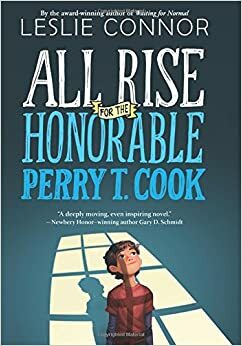 Leslie Connor crafted a winner in All Rise for the Honorable Perry T. Cook. Living in a room near his mother's in a correctional facility, Perry helps the "residents" wake each morning, meanders around the prison with caution and permission, and helps out when he can. He is a friend to all, and the inmates treasure it. His mother is a resident there, and the warden welcomed Perry's arrival without a worry of the unusual living experiences in a prison. Set in the fall, the story opens with Perry heading off to a new school year, camera for taking pictures to show his incarcerated mother Jessica in tow. Lucky for him, he has his best friend in class with him. Sort of. Best friend Zoey is a keeper for sure, especially for a kid who gets bullied because his mother is a prisoner. But Zoey's stepdad is the DA for the county, and when he gets wind of a kid living in a prison, he brings all of his lawyer power into play. Taking Perry out of prison living is one thing, but he delays Jessica's parole hearing indefinitely, turning all plans for Perry and Jessica to live on the "outside" upside down. With all sorts of helpers in many places, Perry interviews inmates for a school project, uncorking more surprises. As he gathers data and evidence, Perry succeeds in proving that the DA is not as supportive as he says he is. But will he get a chance to show others how off-target VanLeer is? A great read, Leslie Connor has a new fan in me! This new perspective on Anne Frank caught me by surprise. I find myself returning to it repeatedly, putting new pieces together, understanding new details, noticing reasons for shading and words and message throughout the picture book. 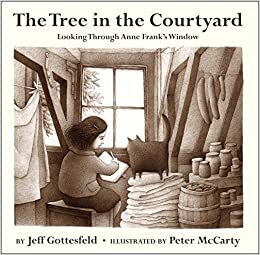 Outside of Anne Frank's window in that courtyard for the first part of her life grew a giant chestnut tree. 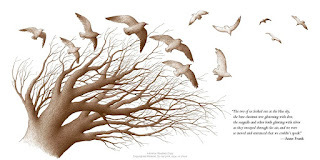 The story chronicles what Anne saw and lived by witnessing that tree, and then after the Gestapo came, her time in the attic, hidden away from the world but seeing that tree and its branches through the seasons. Anne wrote her diary looking at that tree, and several factual details are included in this story. With illustrations by Peter McCarty, the story wraps its lovely story around the reader like a blanket. This book reminded me of Faithful Elephants: A True Story of Animals, People, and War: tragic but oh so important. Powerful. The Tree in the Courtyard. Accomplished author Nielsen set out to help us hear a character's story that would not let the author go. In turn, I was gifted with a glimpse of a life far distant from and wickedly important to my own. 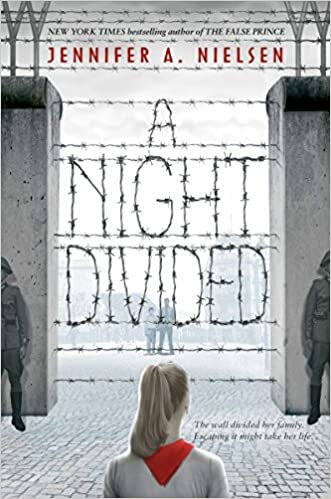 Unfamiliar with a story even remotely connected to the Berlin Wall in YA lit and hearing really great things about this book, I launched into it. The first line of text, after a frightening quote from Khrushchev, reads, "There was no warning the night the wall went up." A stark entrance into a gripping, tragic, and vital story, Nielsen follows the relentless inner voice of Greta, a character who kept "interrupting my thoughts the way I'm sure she pestered her family" (from Acknowledgements). Greta knows what is going on in East Berlin is beyond wrong, and she disagrees that she and her family are powerless to do anything about it. Greta refuses to give up, questioning, searching, and peering into possibility. She also refuses to allow her family's separation to stop her quest to reunite and live in freedom. While I liked how all of the characters were developed, I most appreciated the mother's growth (if that is what you can call it), offering a surprising nugget for the reader. The greatest learning for me was about the Stasi, the cruel, invading, destructive spy military that repeatedly intruded and controlled virtually every breath of the citizens attempting to live under such brutal rule. A tragic story that I needed to hear, I am glad that in spite of the trials of time and other projects, Nielsen listened to Greta and wrote A Night Divided. Uhlberg's new picture book offers a lovely entrance into his life as a child. The most moving part of the book lies on each page where the author notes how sound was such an important offering between and to his parents. Both his mother and father were deaf, and the story represents the ongoing communication of the child's experience with sound during one day of his life. His parents pushed him, it seems, to detail sound through words and sign language so they could make sense of it, but as a child, Uhlberg wants to adequately communicate big life things...like the ocean. I appreciate the challenge he must have felt in attempting to interpret his experience of sound for his parents. 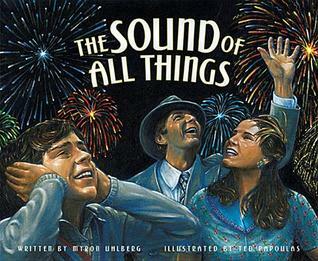 The wide illustrations help expand the reality of sound as well. Important and rich, I really feel awkward writing about this text. Living with deaf parents is not one of my experiences, and yet the book does just what I think so many books ought to do: to broaden our views of the world and the people who inhabit it. Thank you, Mr. Uhlberg, for sharing a small story to expand our own.